KIEL, Germany — A skipper hoping to become the first to sail round the world using solar power said his catamaran could carve a wake for pollution-free shipping as he unveiled the record-breaking yacht Thursday. “This is a unique feeling to see in front of me today a boat which I so often dreamed about,” said Raphael Domjan as the covers came off the 18 million euro (24 million dollar) boat, the world’s biggest solar-powered vessel. 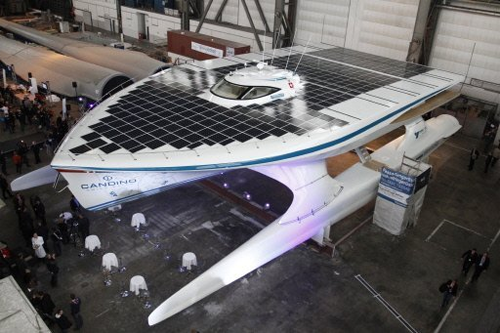 PlanetSolar, a 31- by 15-metre (100 by 50 foot) white catamaran, has been designed to reach a top speed of around 15 knots, equivalent to 25 kilometres (15 miles) per hour, and can hold up to 50 passengers. It is topped by 500 square metres (5,380 square feet) of black solar panels, with a bright white cockpit sticking up in the centre. Constructed at the Knierim Yacht Club in Kiel in northern Germany, its state-of-the-art design also means it will be able to slice smoothly through the waves even in choppy waters. 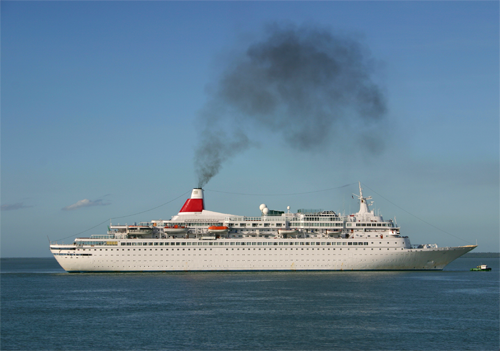 A Hong Kong shipping executive has pledged up to $4.1 million to fund a research program at the University of Southern California to reduce emissions and improve combustion efficiency in marine diesel engines. Kenneth Koo of Tai Chong Cheang Steamship Co. (H.K.) Ltd (TCCHK) says collaboration between industry and academia is needed to substantially reduce the greenhouse gas emissions and harmful pollutants emitted by conventional large bore two-stroke single-acting marine diesel engines used by the world’s merchant shipping fleets.